Finally wearing the Franklin Badge, Ness counters Carpainter's attack. Unfortunately for Ness, Carpainter is starting to show him up in the "make scary faces" department. Ness and Carpainter...duel to the death! Well, almost. Ness' victory is cut short as Carpainter brings on the pain. Kicking a kid while he's down? Obviously Carpainter has been taking lessons from Pokey's dad. A brutal fight...to end with Carpainter as the new star of the comic? Perhaps a sitcom where he rooms with that lovable blue cow. I'd watch it. 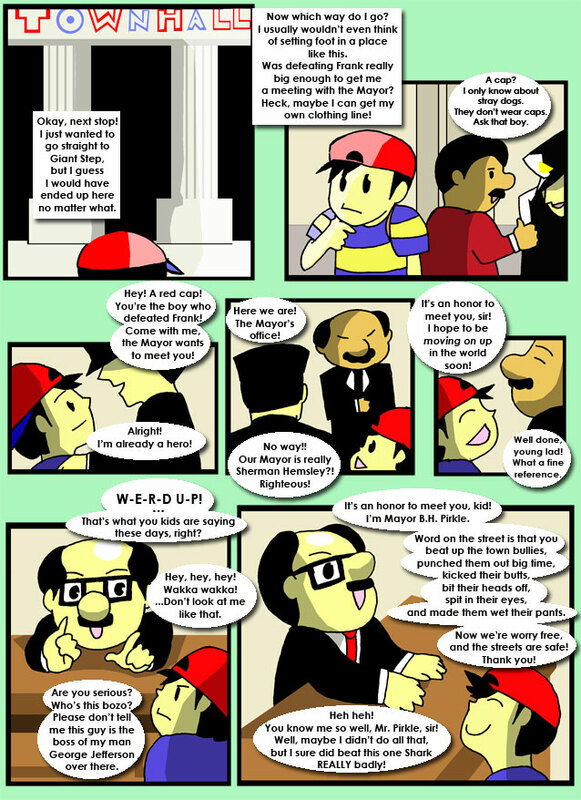 Ness unleashes the next step up in PSI power! All of that level grinding on cultists really paid off.